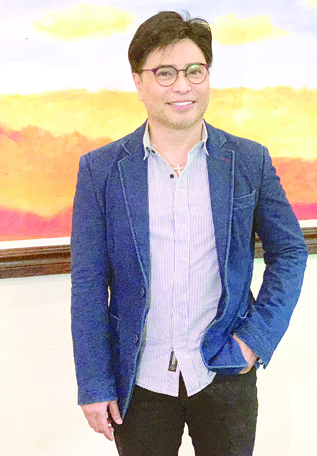 Arnell Ignacio has expressed his intention to do a television show again. But this time, he wanted to host a program that’s similar to what he was doing when he was still part of Overseas Workers Welfare Administration or OWWA as deputy administrator. 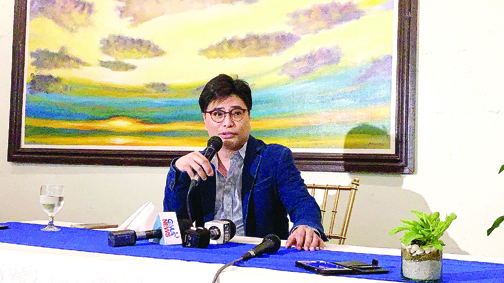 Shortly after he submitted his resignation letter to Labor Secretary Silvestre Bello III, the 55-year-old comedian and former TV host met with the entertainment press to explain the reason of his sudden decision. By the way he sounded, it seemed that Arnell was determined to leave government work behind and finally go back to his “first love,” which is showbiz. “Government work demands a lot of time. My child is having problems. And it’s a difficult feeling to know that your father is getting sicker, and you’re the last person to know,” he shared. Arnell clarified that leaving his post in OWWA was not a sudden decision. He had to consider a few things before tendering his resignation with a heavy heart. “I have personal problems at home. Hindi ko na napapansin, lumalaki na. I was so busy dealing with the problems of our fellow Filipinos working overseas pero sarili kong problema hindi ko na napapansin,” the teary-eyed Arnell confessed. After resigning from his post at OWWA as deputy administrator, Arnell Ignacio plans to go back to show business and host a public service program. “I resigned from my post at OWWA not because I can no longer perform my duties. I loved what I was doing but it was already taking a toll sa aking pamilya. My dad has a 4th stage (prostate) cancer and I can’t even be with him while I left my business to my (only) daughter, Sofia dahil ang oras ko ay kulang pa sa aking trabaho,” he added. “In my almost three years in public service, I have learned a lot. I have seen how dedicated people in the government work. As Deputy Administrator of OWWA, I travel a lot and encounter people with different concerns. I love my job because it touches people at doon ko rin personal na nasaksihan ang mga problema at pinagdadaanan ng marami sa kanila. It breaks my heart,” he said. Arnell is not closing his doors to public service. He said his experience would not go to waste because for his showbiz comeback, Arnell plans to do a show that would be similar to what he was doing at OWWA. Arnell is still open to working with the government. In fact, he would still want to be a consultant for any government agency. He’s also an avid supporter of Juan Movement partylist, a group which, according to Arnell, silently works and supports the efforts of the government without asking anything in return. “I’m going to be their spokesperson. So that means, I can still be involved in a few government efforts even though I’m no longer working for the government,” he ended. At the Senate, Sen. JV Ejercito is careful, deliberate, and level-headed. He prefers to be low-key, maintaining a reserved stance amid the chaos. This senator is unflappable. But it’s really not that hard to find out what makes JV tick. When he takes a break from being a senator, he’s a loving husband to wife Ma. Hyacinth Lotuaco-Ejercito and a hands-on father to their son Julio Jose, who is turning 11 on March 20. Their family includes his eldest son Jose Emilio. 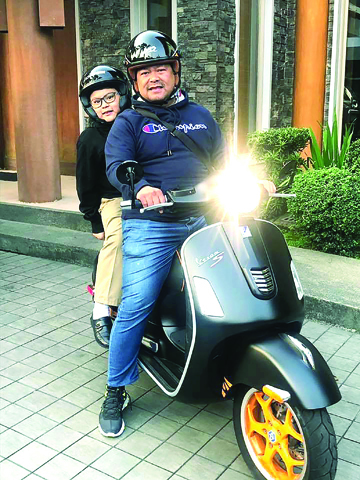 One of JV Ejercito’s favorite things to do is to get on his motorcycle to take his son Julio Jose to school. JV lets go of his reserved demeanor when he’s with his family—especially his two sons. Since Emilio is all grown up, JV’s constant buddy has been his son Julio. JV enjoys doing daddy duties. He is all smiles when he hops on his motorcycle—in his comfy daddy ensemble of shorts and shirt—and takes Julio to school. They also love bonding over food, boxing, basketball, and their beloved dogs. JV echoes the sentiments of parents all over the world. Sometimes they just want time to stop. Then again, Julio won’t stay a little boy forever. With his dad as his role model, we’re pretty sure he’ll be fine. And, contrary to his dad’s prediction, he would probably still want to be hugged.